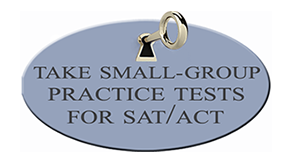 Full length, small group practice tests reinforce new strategies, allow us to measure progress, and increase the probability that your child will achieve the top score they seek. The secret to our practice tests is two-fold: we normalize the complete test-taking experience and, by carefully analyzing the results of each student’s test, are able to tailor assignments that target the areas in need of work. In addition, these full length SAT and ACT tests allow us to see that moment when a particular strategy really “clicks” for a student. Once a strategy is grasped and applied successfully over the course of a test or two, that student has it in their bones. Come the actual test, they, like an athlete, have their routine down cold. The personalized foundation, SAT/ACT test strategies, early start to test prep and the full-length, small group practice tests all add up to the “personal best” score for your child. To find out the specific areas in which your child needs improvement, please call 408-823-9999 or email us to schedule a personal assessment.